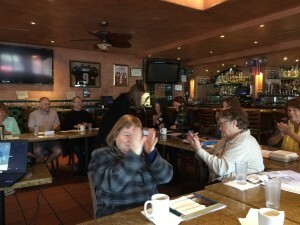 Best Table Topics: Elizabeth S.
Visiting Toastmaster Daniel Steenerson presented his winning District 5 Central Division International Speech, “Rock Star.” Daniel will be competing in the International Speech Contest during the Spring Conference on April 30 2016. Good luck Daniel! Nancy J brought two of her English as a Second Language (ESL) students to our meeting. What better way to learn to speak and listen than through Toastmasters? Nancy will be leaving for Maine in May, but will return again in the fall. We will miss her! Visiting Toastmaster Jill Badonsky presented her winning District 5 Southern Division Humorous Speech, “There Ain’t No Ballerinas in Hip Hop.” Jill will represent our Southern Division in the District 5 Humorous Speech Contest during the Spring Conference on April 30 2016. Good luck Jill! Next week’s schedule includes visiting Toastmaster Jill Badonsky, winner of the Southern Division Humorous Speech Competition. Her speech will be in preparation for the District 5 Humorous Speech Competition on April 30. An unexpected last minute change of venue due to maintenance from our usual Café Coyote Grande Cabo Room location to the Café Coyote Cantina. Yes, Voyagers Toastmasters hit the bar first thing this drizzly morning!